Brief Synopsis – After her father is murdered, a woman tries to find a gunman to seek revenge for her. My Take on it – I didn’t know what to expect with this film and was unfortunately very disappointed at the end result. 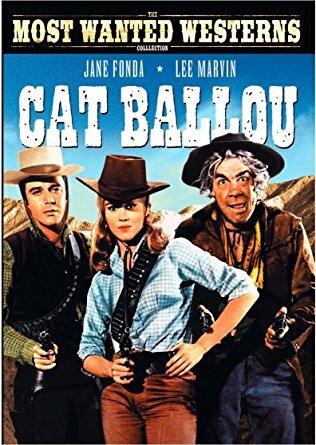 This is a very weird western-comedy that just doesn’t work at all largely since it comes across as being too over the top in juts about every production aspect. None of the characters are interesting enough to care about and the dialogue between them doesn’t stay focused at all. I am still completely baffled and confused as to how Lee Marvin (a great actor in general) was able to win a Best Actor Oscar for this role. I didn’t find his performance here memorable or powerful in any way, shape or form. The one saving grace of this film is the musical interludes that add to the narration of the story; every so often, we are treated to a few minutes of great singing about the story by Nat “King” Cole and Stubby Kaye. They are truly the most (and probably only) memorable aspect of this film. Besides those scenes featuring this duo, there really isn’t much else worth while watching in this film. Bottom Line – Very strange Western comedy that is done too over the top. The characters aren’t interesting enough to care about and the dialogue meanders along most of the time. Still baffled as to how Marvin walked away with a Best Actor Oscar for this role because this wasn’t very memorable or powerful at all. The best part of this film are the singing narrative interludes by Nat King Cole and Stubby Kaye. Other than those few scenes, this film can be easily skipped over. I like this one. It is a bit strange, and it doesn’t age all that great – but Marvin (in his duel role) is pretty funny. And the shot of him – drunk – along with his horse – leaning up against the brick wall – is iconic. That’s what he meant when he thanked the horse. As to his winning Best Actor – have to look at the competition again – might’ve been a career award – playing way against type from his usual tough guy (ex-Marine) roles. It was also the first and only time he was nominated in his career. I liked it. I particularly loved the musical interludes. I do agree with you about Marvin’s Oscar. Nominees Rod Steiger (Pawnbroker) or Richard Burton (Spy Who Came in from the Cold) were much, much better. I think people were shocked that heavy Marvin could do comedy.